Northampton full-back Ahsee Tuala has signed a new deal, while Scarlets back-row Sion Bennett and Sale scrum-half Alex Mitchell have agreed to join the Premiership leaders from next season. Samoa international Tuala, 25, joined Saints on a contract to the end of the season in February, and has scored four tries in his eight appearances. Wales Under-20 man Bennett, 21, has played eight times for Scarlets. And Mitchell , 17, has seven caps for England Under-18s. 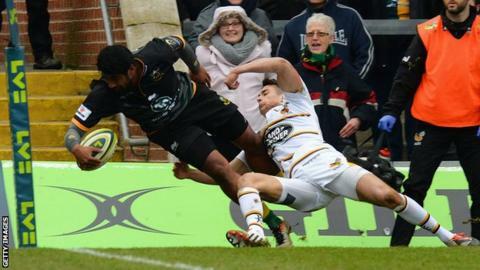 Saints director of rugby Jim Mallinder told the club website: "Ahsee has been a good player to have around the club. "He has worked hard on every aspect of his game, and has settled in very well with the rest of the squad." Of the youngsters, he added: "We've got a lot of talented youngsters coming through our own academy system, but we always have an eye on what is happening elsewhere, and Sion and Alex are two very good players who we believe have a lot of potential to impress in the years to come.